Easy-Count Guideline Easy Count Guideline #4499  - $10.72 : Yarn Tree, Your wholesale source for cross stitch supplies. Item 4499. Tired of counting? Easy-Count Guideline” is the best product to keep your place on the fabric itself, reducing counting time and improving your speed. “Easy-Count Guideline” will assist you in locating the exact point to stitch on the fabric. 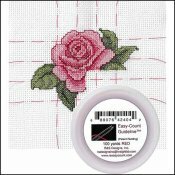 Use to mark your center lines or you can form Guideline boxes to match the cross stitch grid pattern, making stitching a breeze. This product is an asset to any stitcher and is easy to add to a project in progress. Removes easily and there is no color transfer from the guideline to your fabric. No risk of splitting the nylon guideline or your threads.